Because the animals were in mostly good shape -- even Pattie is housebroken, and walks on a harness -- McKillip speculates the trio had owners who loved them, but perhaps fell on hard times. "It can happen to any of us," she says. And they've had a good run at the shelter, for the last couple of months. The Ps live together in a kennel, and -- as you might expect, given their very high cute quotient -- they get lots of attention and love. Sometimes Pattie may be required to wear a darling little hat, as you can see in the above photo, but she doesn't seem to mind. But McKillip and her coworkers want to see these guys where they really belong -- not in a shelter, but in a home. Unfortunately, the inquiries that have come in far are for just one or two of the animals. Not all three. "The staff, we cry about it when we think about separating them, and I'm getting emotional right now. I don't want to separate them, so please come help," McKillip said to WFMZ-TV. So here's what you need to know, to get these three special critters: The dogs are small, playful and easygoing. The pig is 120-pounds, is an indoor pet and -- clearly -- has a lot of character. Their adoption fees are covered. If you're out of state and interested -- or even just want to talk about fostering before committing to a permanent adoption -- still, give the shelter a ring. And here's the shelter's hope, for these guys: "Adopted by a loving family that appreciates how amazing they are. And they get to live out their lives together, having fun," McKillip said. We, too, would love to see these three walking away from the shelter and into their great new lives. Pattie Pig on a harness, Pickles beside her and Paprika right where she belongs -- hitching a ride on Pattie's back, going on home. please give us a happy ending for this sometime soon. "They're like a real family." LEWISBERRY, Pa. -- During the holiday season, it's important to make time to be with the ones closest to you. But, for three unlikely family members, that almost didn't happen. 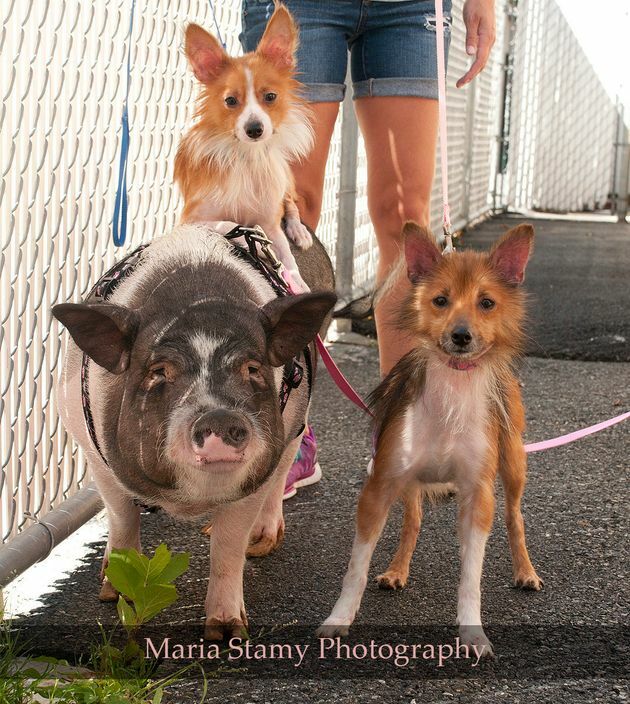 This story starts with two dogs and a pig. The three have been together for a long time, since the dogs were puppies. The animals needed to be kept together, but, as you can imagine, it's not the easiest finding someone who will adopt two dogs with a pig. The Animal Rescue League of Berks County was on the brink of giving up. Faced with the heart-wrenching decision to separate these three family members, they decided to take one last shot by listing the adoption on social media. The post was shared hundreds of times through Facebook, Twitter, email, and text messages. That's when the animal rescue received a gift 76 miles away in Lewisberry. "There's no reason to separate them if you don't have to," Kristi Maher, owner of Blue Hound Farm on Pleasant Hill Road, says. It's been the perfect home for these forever friends ever since. "Those dogs, they can do anything with her," Maher says, noting the pig, who acts much like a dog, sitting and sleeping on the bed. Sometimes, the pig responds to the names Patti or Penny when called. "You can tell she's been with them for a long time," Maher says, "The dogs can eat with her and for a pig to share its foodthat's pretty impressive." For where else can you find a pig who thinks she's a dog? It's a wonderful story of hope, but an even better story about love: the tale of a pig, two dogs, and their inseparable bond. To visit these three amigos at Blue Hound Farm, head to www.bluehoundfarm.com.